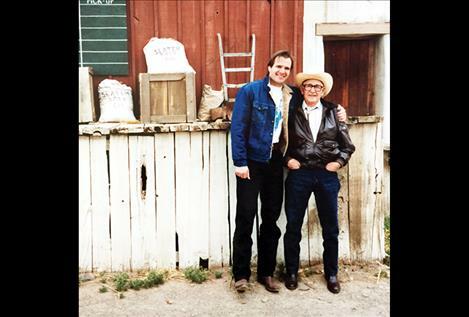 Tim Ryan Rouillier stands with his grandfather, Vic Cordier, years ago. They traveled across Montana to play music together before Cordier died on stage during a concert at the age of 93. Ryan Rouillier is coming home to develop a project after 30 years of working as a country music songwriter and recording artist in Nashville. 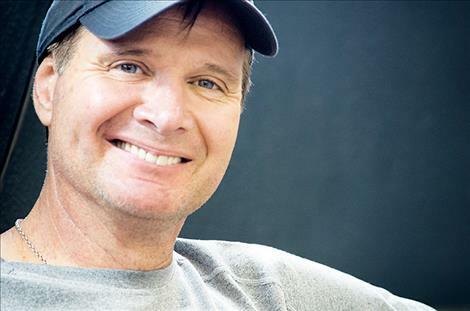 Back in Nashville, he started thinking that it was time to start wrapping up aspects of his career. He talked about that moment as he sat in a coffee shop in St. Ignatius on Friday, May 5. And he couldn’t do the show without including the Salish heritage his grandfather passed down to him. 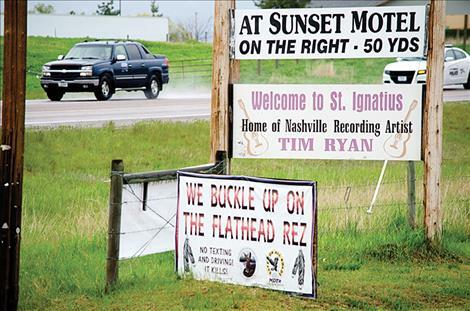 He asked drum groups and dancers on the Flathead Indian Reservation to help with the project, and it wasn’t difficult to find people to help. 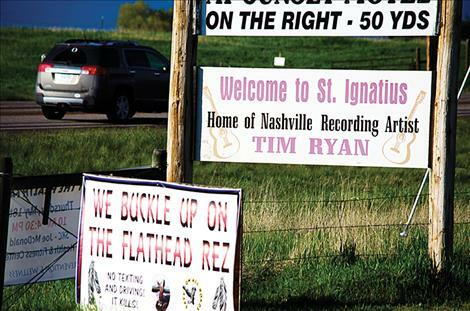 Rouillier grew up on the reservation in St. Ignatius and he knows many people. The songs he plans to feature in a concert at the University of Montana in June include places he visited around Montana with his grandfather while he was developing his musical skills. Rouillier was about four years old when his interest in music was sparked by his grandfather. 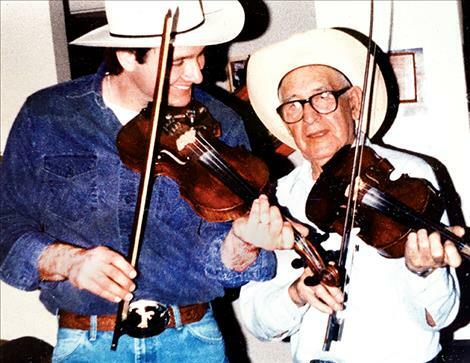 Grandpa Cordier had a fiddle he found in an old farmhouse when he was a kid and he learned to play it by ear. “I don’t know what I would have become if he wasn’t interested in music,” Rouillier said. Cordier was a judge for the Confederated Salish and Kootenai Tribes by day and a fiddle player by night. “He loved playing in the kitchen, getting his foot to ‘stompin.’ My grandmother would yell that he was going to make things fall off the walls.” This kind of fun made an impression on young Rouillier and he wanted to play, too. “I was terrible, but I kept practicing,” he said. Eventually, the two harmonized a guitar and fiddle together well enough to go on tour around town but mostly on the front porch for neighbors. Rouillier said his grandfather took him out to the National Bison Range where they played from the bed of a truck during dinnertime after the bison roundup. Rouillier continued to practice and their tour expanded around Montana from dances to rodeos. All his practicing eventually paid off when Rouillier signed his first recording contract with CBS Records in Nashville in 1987. When he made his first music video “Dance in Circles,” his grandfather was the star fiddle player. Several years later, in 1994, Rouillier was on stage with his grandfather. They were playing for the annual fundraising scholarship concert Rouillier developed for high school seniors in the Mission Valley. After Cordier played the “Kentucky Waltz,” he fell over. “He died at the age of 93 doing what he loved,” Rouillier said. Rouillier wants to wrap up his career and honor his grandfather by putting together a symphonic memoir called “Play Me Montana.” The show will go on stage at the University of Montana’s Dennison Theatre on June 17. People can buy tickets at 888-Montana. Rouillier wrote several new songs for the event with co-writers Charlie Black, Sharon Vaughn, and Alex Harvey. He plans to have 145 musical guests and dancers participate in the event including Lari White, Mike Ulvila, The Durglo Salish Drum and Dance Group, Trevor Krieger, Salish Native Woman, and the N’kwusm Youth Choir. Gordon Johnson will conduct the Missoula Symphony Orchestra. 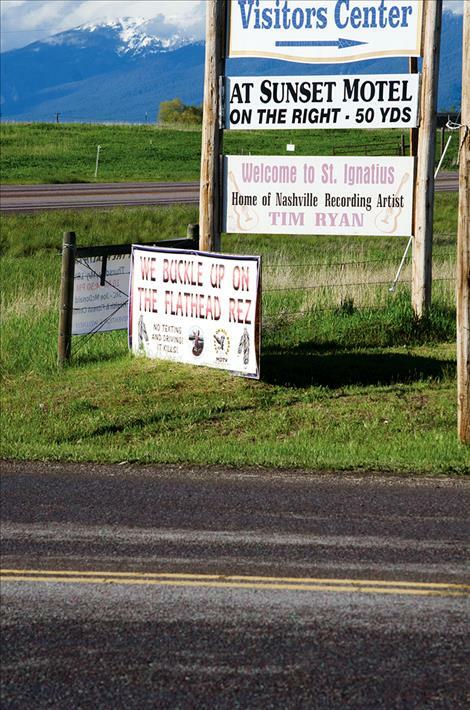 “We are going to have the kids choir from N’Kwusm sing with help from Stipn Small Salmon and native dancers come in to tie in with these new songs,” he said. The concert features a big screen behind the music with video Rouillier took of the places he and his grandfather once visited around Montana. A crew from the U of M will put a film together of the concert. Rouillier hopes that it gets published worldwide with the Public Broadcasting Service (PBS). He also wants to take the show on tour if all goes well.